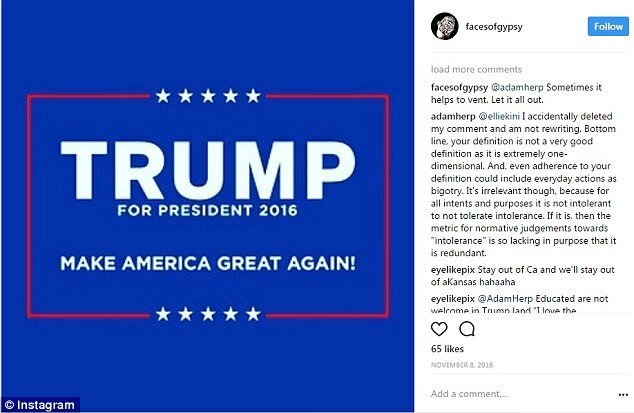 A Kansas makeup artist says she won a national contest sponsored by Kat Von D Beauty but was later disqualified because of an Instagram post supporting Donald Trump’s presidential candidacy. Screenshots taken by Gypsy Freeman show she was declared the winner last month of an Instagram “Saint + Sinner Contest” sponsored by the makeup line, which was founded by tattoo artist and former reality show star Kat Von D.
Freeman’s entry was an Instagram image of an angelic figure beside a girl in an all-black outfit and thick mascara, the Wichita Eagle reported. The winner of the Saint + Sinner Contest – and a guest – was to be flown to Los Angeles to attend the launch party of a new makeup line from Kat Von D, perhaps best known for her role on “LA Ink.” The approximate value of the prize package, which included a $500 gift card to Sephora, was $2,100. Von D, who starred in the tattoo-themed TLC reality show “LA Ink,” later messaged Freeman on Instagram to say she had “drawn a personal line in the sand between myself and anyone who supports that man,” according to screenshots of the conversation. The Florida-based photographer who took the photos for Freeman’s entry, Jenn Bischof, was invited to – and attended – the launch party in her place, Freeman said. A post on Bischof’s Instagram account shows her at the party alongside Kat Von D.
All evidence of the contest’s existence has since been deleted from the brand’s Instagram account and website, though the contest rules are available in a cached version of the site. “I didn’t erase (the Trump post) either,” she said. “Part of the great thing about this country is having freedom of speech. Freeman – who does fashion editorial, styling and a variety of bridal work – said she has used Kat Von D Beauty products in her makeup kit for years, though she will likely stop doing so. She said she plans to contact Sephora, which sells the product line, about the incident as well. Multiple phone calls and messages left with Kendo Holdings, the parent company of Kat Von D Beauty, have not been returned.